By now many of you know that I am a huge fan of Autism New Jersey, and that I always try to attend their conferences. I learn so much, and even if some of the things I hear don’t resonate with me, there is so much to take away and mull over. I like that they are results oriented and nerdy, and that they grapple with issues like productive solutions to legislative foot dragging, families struggling with feeding, aggression, lack of respite and so much more, and the giant behemoths of housing and employment. Everything matters when it comes to autism. There is no luxury to separate macro from micro. And no one gets a pass to scoff at the minutiae. You’re either all in or you need to be quiet. That’s why I like ‘em. I attended only two talks this time. We have a couple of years before A gets to the transition prep age, and are already dealing with a great many immediate behavioral mountains so I try not to let myself get overwhelmed by the distant vista and its future peaks and valleys. Easier said than done, but, as people always say about special needs, this journey is a marathon and not a sprint, needing us to practice good self care and not tumble into any canyons of anguish. The keynote speech was by Dr Paul Shattuck of Drexel University, and was titled “A Life Course Perspective on Autism and the Transition to Adulthood.” I have to say, the title gave no indication of what a data hound Dr Shattuck turned out to be, haha. He is adamantly on the side of numbers crunching and I have mixed feelings but also much respect for his argument. It is almost a tired trope by now that adult outcomes for autism are largely horrendous, despite copious research, funding and effort. How can there be such a disconnect, and so little return on investment? (Partly, I wondered, if, thanks to bureaucratic roadblocks and inane, constantly shifting legislation, families become accustomed to merely coping; we live lives of quiet desperation and give up on meaningful change). We would not tolerate such failure in other realms of study and public infrastructure. Dr S contends that it is time to move beyond anecdotal evidence, and that the gap in research and funding is in the sphere of lifespan issues. While we tend to look at training autistic individuals for specific jobs, and whether they are acquiring skills, for example, our lives are embedded in social contexts, and our stories unfold through how we are connected to one another. Therefore, the system the person exists in has to be studied, and we cannot just modify autism behaviors and hope that national outcomes will magically be affected. Dr Shattuck went into detail about the National Autism Data Center, which is modeled after think tanks, in order to generate numbers which policy makers can relate to. Branded as a census bureau for the autism population, it garners researchers a seat at the table at legislative sessions, and helps them highlight actual needs, and study whether the needle on the autism outcome gauge is actually being moved. “A needy population doesn’t count until someone counts it” was the stark phrasing used. There is such a disconnect between transition planning in high school, and actual work and continuing ed opportunities. Further, in that disconnected demographic, many also lack access to any services at all, and of course, lower income households fare worse. Dr S said that the NADC benefits from vigorous marketing and branding, and that it courts that PR engagement intentionally because it’s the only way to effect change. Dr Shattuck went on to talk about the Transition Pathways project at Drexel, which aims to be an “innovation incubator.” It works with the inner city autism population in Philadelphia, using both autism specific intensive methods that are focused on the individual client; and inclusion, viz. working with mainstream groups that serve youths, so that the autistic young people can fit into those mainstream work programs. This is awesome stuff. The project stands out because it aims to be replicable in other parts of the country, and also because it is structured to be replicable in its problem solving approaches. Local subcultures and micro economies tend to be dynamic, and cannot be standardized. It also made me think of our Indo-American communities. This is why it’s so hard to connect us to policy level change UNLESS we acquiesce to being counted as part of the majority, which means our autistic ABCD kids and our limited access to communal support (because of being such recent immigrants) rarely get factored in. I hate that so much, and while I don’t have data to back up my frustration, someone with less loathing of math surely could compile some. Please do! We also learned about Project Search at Drexel, which is a one-year school-to-work program for autistic youth. They get help with internships at various companies, practice workplace immersion which is rotated so they can try out different careers, and receive customized job search assistance, all with the goal of ultimately being placed in competitive employment. It was heartening to hear of the various institutions and companies that are open to hiring. One of them hires students to work in national parks, thus allowing them to explore careers in conservation. It is an existing program made friendly for autistic youth, which is really what is needed so that jobs needn’t become defunct if, say, funding becomes problematic. Supported employment is really the key to good outcomes, and we have to be invested in this as a larger society. I have said it before in this blog, and cannot say it enough. Our South Asian community can do so much better in this regard. Let us stop thinking of autistic people as recipients of charity. Hire them. Train yourselves as employers and co workers so that jobs programs can succeed long term. Create work environments where job coaching and support can flourish. Let’s not be passive about this. As Dr Shattuck pointed out, the degree of connectedness of the individual to society determines whether they succeed. Just like you would bend over backwards to see your neurotypical child get into good colleges and jobs, help make this a reality for the autism population too. Please. I was amazed by the thoughtful comments made by parents in the audience after the talk ended. Sometimes you have to endure a bunch of emotional anecdotes, which, when you are in conference mode, is not okay. One parent pointed out that, since manufacturing jobs seem to be going unfilled, we should be identifying youth who have an affinity for such work, and training them. We should not fall into the trap of thinking that not going to college is somehow non-inclusive. Another parent said that day programs for adults tend to be very boring and not at all focused on skills and strengths. We must question the built-in assumptions in Vocational Rehabilitation thinking—people will not need help only to find one job. The career model of today is more fluid, and people tend to change jobs more often. We need Voc Rehab funding to last beyond the first job placement; and we need a Medicaid waiver to apply to job supports, to prevent behavioral issues from causing job loss as far as possible. If the data shows that x number of people were hired, but doesn’t reflect that half that number were fired soon after and had no help thereafter, what is the use of such data? The last parent to make a comment said that just graduating high school and checking off the box of transition planning is not enough. She found that the planning that began for her child at age 14 was very token, and then when he was between 16 and 18, it was too late to make any significant leaps. Dr Shattuck jumped in to agree, highlighting that just working on ‘fixing’ the person does not address the flaws in the overall system. We must have a relentless commitment to improving the quality of help, and we need solid performance metrics to foster accountability. He pointed out that states and school districts collect data differently, and not all the data is comprehensive. If at all I felt ambivalent about all this data crunching, valid as the arguments were, it is because I have some PTSD about having my family be harnessed to ideals and abstractions that I don’t always identify with. But Dr Shattuck’s viewpoints were wonderfully expressed and I came away with lots to think about. 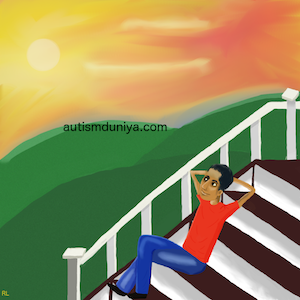 In the end, we all want supportive environments for our kids to thrive, and that won’t happen just by wishing and hoping, nor is it sustainable if only the wealthy and well connected are able to procure good outcomes for their autistic children. If data is how we do better, and overburdened legislators and jaded, deep pocketed donors will listen to nothing else, then I am glad that such endeavors exist to further our collective cause.